It turns out that the first thing you may make in a five-week ceramic class is a rock, maybe two. Exactly how your rock turns out will depend on your clay and on your ability to not make everything look like a potato. Alas. Everything I makes looks like a potato. It takes weeks to make a potato rock. Week one: Make the potato rock. Week two: scrap the potato rock. Week Three: fire the potato rock. Week four: glaze and once again fire the potato rock. Week five: take your potato rock home to your slightly baffled family. We made other things. I made these mugs, for example. Let's just say, for argument sake, that they they are different sizes on purpose. Alas, the cups are still being fired. I also made a bowl, which I forgot to take a picture of you. Trust me, you are not missing a thing. You do not go from potato rocks to The Wheel in five weeks. Ask anyone: the wheel is hard. These things are all hand built, which is a generous use of the world built. Wanna make a rock? All the cool kids in the San Gabriel Valley are doing it here. It's super cheap too. Seriously, the best part of class is seeing the amazing work that OTHER people make. Not ready to make a rock? Then read this piece I have up at POPMATTERS. 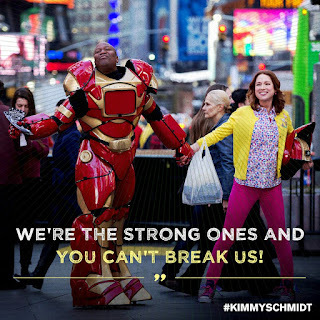 It's about how The Unbreakable Kimmy Schmidt is profoundly broken. Unfamiliar with the wonderful Netflix comedy The Unbreakable Kimmy Schmidt? Where have you been? Hiding under a ceramic rock? I like the handles on your cups. Too often they are small and difficult for people with arthritis, or large hands, to manage comfortably. Keep at it.... takes a long time! I admire your use of summer break time to explore rock formation -- they're pretty convincing from here! My husband's already viewed Season 1 of Kimmy Schmidt so now I've gotta do this binge thing and finish what I started. That's cool. I admire anyone with skills like these. Hey, even a rock would be a very hard thing for me. Everything I ever made, in high school and adult ceramics class, came out an ashtray. Just read your excellent POPmatters essay. How we and our mothers and sisters have been conditioned to hide. No, we don't have to be defined by our traumas. For me, the challenge is remembering that and believing that in the moment. Look at you all learning new things and letting out your inner artist. You can reframe and say that potatoes tend to look like rocks. No reframing around your essay, though--you are an accomplished writer of the highest order. Great essay. I like the word "broken" in relation to art; it makes sense to me that creativity comes from that chaos, like it or not. Is the Monrovia center the place where the big bowl event happens? It's my favorite event ever. I once took a ceramics course similar to what you're describing. I made a rock, too, altho it was hollow - the top was a lid. I also made some wavering, leaning-tower-of-Pisa vases on the wheel. Make sure you sign up - today may be the last day you can. They're getting weird about accepting students once class has started. School district bs.